Over the past 25 years, Liquid Engineering’s clients have included over 25,000 water utilities throughout the country, nearly 300 consulting engineering firms, dozens of contractors and federal governmental agencies, the Department of Defense, tank manufacturers and painting firms, and numerous Fortune 500 and O & M companies. Why do clients select LEC time after time? Inspections – LEC’s inspectors can provide everything from routine exterior assessments, to detailed interior and exterior structural engineering inspections of your potable water tanks, reservoirs, water towers and clearwells. 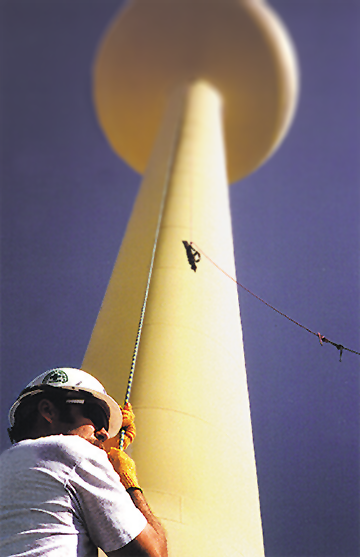 These are conducted by our licensed Professional Engineers, NACE-trained coating and non-destructive (NDT) inspectors. Diagnosis – Our technical experts, engineers, project managers and field support teams can assist you in identifying cost-effective, real-world solutions to your water system operating and maintenance needs. Baseline condition surveys with specific maintenance budget recommendations are a specialty. Security – LEC can provide referral to some of the water industry’s preeminent security consultants, as well as real-world security upgrades and hardware retrofits. Additionally, LEC can provide financing programs for client security implementation upgrades, vulnerability assessments, security audits and emergency response plans. Rehabilitation – LEC provides detailed recommendations for rehabilitating and upgrading all elements of your water tanks. These recommendations are meticulous, specific and to-the-point. Additionally, we will provide you with a detailed plan that will allow you to develop an achievable and realistic long-term maintenance program and budget. Mitigation – LEC reporting provides a prioritized action plan with costing for all necessary repairs, rehabilitation and compliance upgrades, to bring your water storage facilities into compliance with all applicable legal requirements and regulatory standards and recommendations. Guaranteed Satisfaction – On time and on budget, job after job. LEC’s customer satisfaction rating continuously exceeds 99%, in audited follow-up customer satisfaction surveys and repeat customer business.